Based on the popular gem swapping game, it displays five rows of coloured gems and ten possible paylines, giving you endless ways to win. When a group of gems (3, 4 or 5 gems) match, you receive the payout and the symbols subsequently vanish and are replaced with symbols from the line above. Should these form winning combinations, you get paid once again and the gems explode and are replaced with new symbols. This can keep occurring until you run out of winning combinations! • This Video Slot has 10 paylines. • Bejeweled is Wild and substitutes for all symbols. • Super Jackpot pays 20,000 x bet per line when won on line 10. 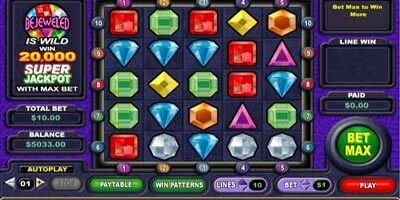 • 5 Bejeweled symbols on lines 1-9 pay 1000 x bet per line. • 5 matching symbols on payline 5, plus 5 matching symbols on payline 6, 7, 8, 9 or 10, pays 8,000 x bet per line. • Winning combinations on an active payline disappear and are replaced by the icons above which drop down in their place. This extra chance of winning repeats until there are no more winning combinations. 1. Click the Video Slots icon in the Casino Lobby. You will be taken to the Video Slots Arena. 2. Choose your desired game in the Video Slots Arena. 3. To select the amount of lines you bet on, click on the arrow buttons beneath the "Lines" display window or click on the colorful line buttons on the sides of the reels. The lines you choose will be your active pay lines when you bet. 4. To change the bet per line, click on the arrow buttons beneath the "Bet" display window. 5. Your total bet amount will equal the number of lines selected, multiplied by the bet per line value. 6. All symbols pay left to right on consecutive reels of an active pay line, except the scatter and bonus symbols. All Wins are multiplied by the credits bet per line, except for scatter wins, which are multiplied by total bet. 7. Scatter and Bonus wins are paid in addition to pay line wins. 8. Note that only the highest win will be paid on each of the active pay lines. 9. To bet the maximum lines allowed (amount differs between machines), click "MAX LINES". 10. To view the Video Slot Machine's different winning combinations and special features click on the "Paytable" button on the machine's buttons panel. 11. When hitting a winning combination, the appropriate payout amount will flash on the electric text board display and the winning lines will be highlighted simultaneously. You may also see your total win amount by viewing the "Paid" display window. 12. To return to the Video-Slots Arena, from any of our Video Slot Machines, click the "Go To" button on the tool bar. A menu will appear. Click on "Back to Arena". "Bejeweled * How to Play * 5 Pound free"